The San Francisco Chronicle’s October 25 front-page story, “S.F.’s homeless crisis: Can Ed Lee clean up streets,” set a new low for erroneous reporting on the issue. The story’s conclusions—that Mayor Lee has ignored the homeless problem, that homeless coordinator Bevan Dufty accomplished little prior to the Navigation Center, and that “answers to the problem appear increasingly hard to find” are all demonstrably false. San Francisco deserves honesty in addressing its homeless problem. So lets compare this highly promoted story with the facts. Has Mayor Lee Ignored Homelessness? The Chronicle reporters could also have read Kevin Fagan’s May 15, 2015 story, “Mayor Lee looks to spend millions more on homeless.” The backdrop was Mayor Lee’s presence at the Raman Hotel as it housed graduates from the Navigation Center. The reporters also ignored the Mayor’s October 13 event at the opening of the 180-unit Baldwin Hotel for the formerly homeless—a story the SF Chronicle did not cover. 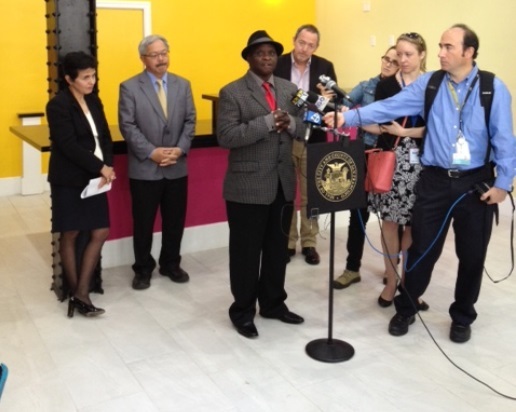 Lee has routinely attended openings of new housing and shelters for homeless persons. He also funded the addition of 500 supportive housing units in this year’s budget and is committed to 500 more next year. The story even falsely claims that Bevan Dufty was “was mostly left on his own to try some small programs.” I cannot believe that anyone covering the city for the Chronicle could not recognize Dufty’s outsized role as the Lee Administration’s point person on homelessness. Since 2012 Dufty has done more to keep the homelessness crisis on the front burner than any public official in San Francisco. He performed this role even as he avoided public credit for such successes as creating housing for homeless veterans at the Fairfax Hotel. Dufty deserves all plaudits for moving the city forward on homelessness. But Bevan only had the opportunity to make such a difference because Mayor Ed Lee created a special position for him. The San Francisco Chronicle has featured many informed articles about homelessness. But having reporter Heather Knight cover the mayor’s record on homelessness is like having NY Times columnist Maureen Dowd write about Hillary Clinton’s record on any issue; the reporter’s personal animus toward their subject leads to falsehoods and an inaccurate story. Mayor Ed Lee has not ignored homelessness. The issue was off the front pages soon after Newsom’s second term began and the city’s budget deficits then limited the mayor’s ability to increase homeless program spending. But since the city had new money to spend in the past two budgets, the Mayor has invested heavily in a problem that no prior mayor going back to Dianne Feinstein has had sufficient resources to solve. Further, where the mayor’s performance has fallen short—such as in the city’s less than effective street outreach—it’s not because the mayor wouldn’t invest in the problem. Lee added over $1.5 million to the city’s homeless outreach budget in a special spring 2014 appropriation only to see the Health Department suspend the program rather than ramp it up as promised.The buck stops with the mayor on the street outreach program’s performance (which is finally improving) but he cannot be faulted for not providing the resources. As I recently described (“The Perfect Solution to Homelessness,” September 26, 2015), we have long known the “answer” to homelessness. A combination of supportive housing, a dramatic increase in federal affordable housing funding, and strategic street outreach would go a long way toward solving homelessness both in San Francisco and the United States. It would return the nation to the pre-1982 era before widespread visible homelessness became common. Yet Knight and Palomino choose instead to insult our intelligence with lines like this: “San Francisco spends $167 million a year on supportive housing for formerly homeless people and services for those still on the streets but Gould doesn’t see the payoff.” Debi Gould has previously been identified as a retired flight attendant who bought a condo in South Beach. The reporters use her view that there is no “payoff” from city funding and that “we aren’t seeing any differences coming from City Hall” as a surrogate for their own perspective. I wonder if Gould’s response would be the same if the reporters had brought her to the Stanford Hotel and had her ask residents if that supportive housing funding is making a difference in their lives. It might have changed her perspective. But the issue isn’t Gould, who spoke truthfully about her feelings. Rather, the reporters use Gould like climate change deniers use other sources that lack expertise: to give a “person on the street” perspective that contradicts known facts. Reporters know that supportive housing requires annual rent subsidies that are getting even more expensive as the gap between poor people’s incomes and market rents grows. Why then does the media continually point to the $167 million figure and try to deny that it’s making a difference in thousands of people’s lives? Where is the morality in this? No reporter would dare foolishly question the massive amounts spent on cancer research because the lack of a cancer cure means we aren’t seeing a “payoff.” So why promote the lie that spending to house homeless people makes no difference? All these type of stories do is make it easier for politicians and portions of the public to justify not funding affordable housing and other solutions to homelessness. And Congress hardly needs further reasons not to ensure housing for the poor. The truth is that no San Francisco mayor can “clean up the streets” because the city lacks the resources and the physical space to house everyone who comes to San Francisco seeking housing. The city can provide more exits, which it is doing. It can also do a much better job addressing those on the street with mental health issues, and I hope Mayor Lee moves forward on this. San Francisco can do better. But with Congressional Republicans refusing to provide necessary funding and even California Governor Jerry Brown rejecting virtually every effort to increase state resources, placing all of the blame on local government for not solving the problem is a cynical, dishonest and counterproductive approach.